I splurged this year. I admit it. But there’s a method to my madness. Here’s my splurge, this adorable angel! What I do is buy angels during the Christmas sales and lambs during Easter sales, then I use them year round. 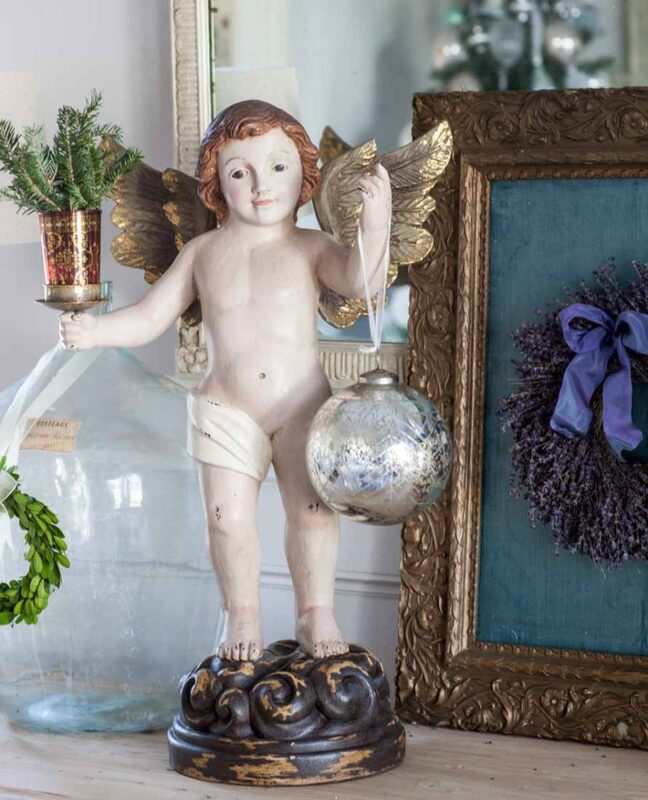 This angel has a candle holder that currently is holding a glass full of greenery. I’m going to keep the angel out all year and put seasonal things in his hands. Doesn’t he have a sweet face? I’m not sure if it’s a boy or girl. I buy angels at Christmas time (typically on sale) and then use them all year. You can see my evergreens in the Moroccan tea glass. Check out today’s episode of the podcast. It’s one of our favorites. Today we are doing a Best of episode on our favorite paint colors. Here he is holding a large mercury glass ornament. In February, he’ll be holding a Valentine’s Day heart. I may look for a lamb ornament so he can hold a lamb during Easter-time. His wings are gorgeous with gold leaf gently applied. He is sold out, but I’ve curated some other Christmas items below that could be used all year. I’ve also gotten some super charming candles for my Christmas tree. These are obviously electric so there’s no open flames. 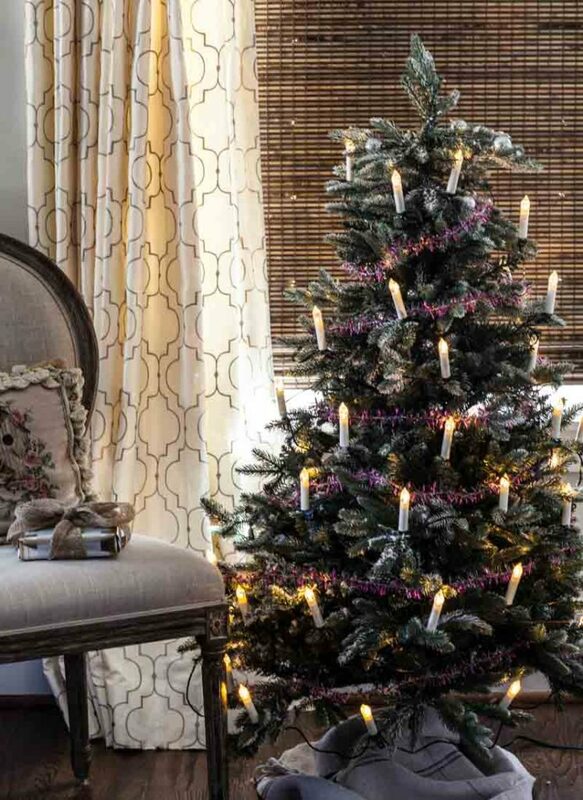 The candles clip on the tree branches. I used one set for this small tree. 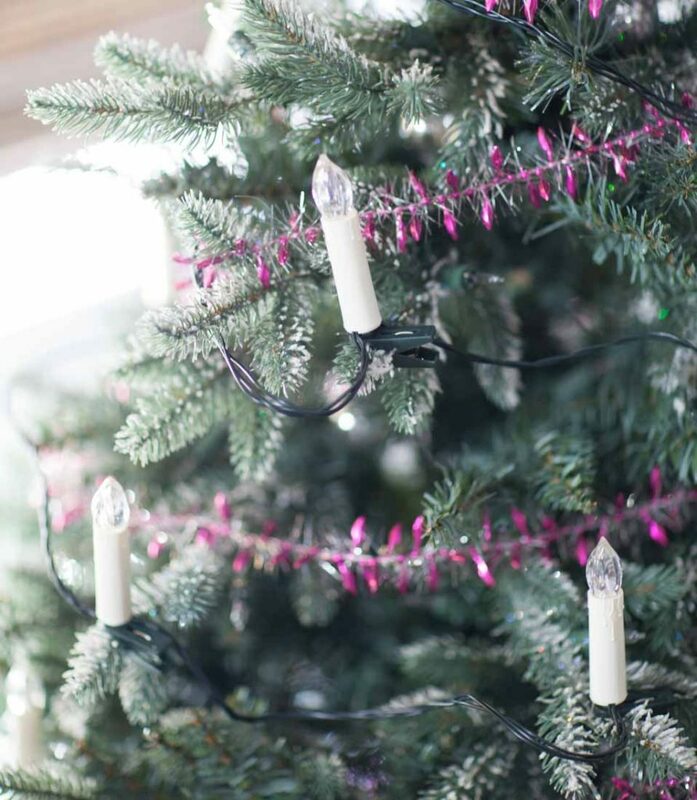 If you were ordering these candles for a full sized Christmas tree, I am guessing you would need 3 – 5 sets. You can find them CLICK HERE. They really are a lovely addition to a tree. 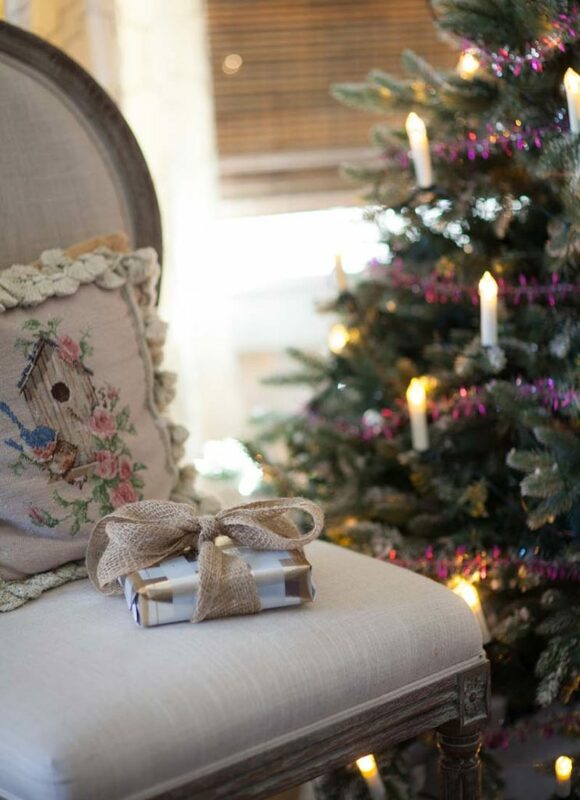 You could also use them on your fireplace mantle or staircase attached to a garland. I hope you are enjoying your time between Christmas and New Year’s Day. And thank you so much for your interest in the two giveaways! 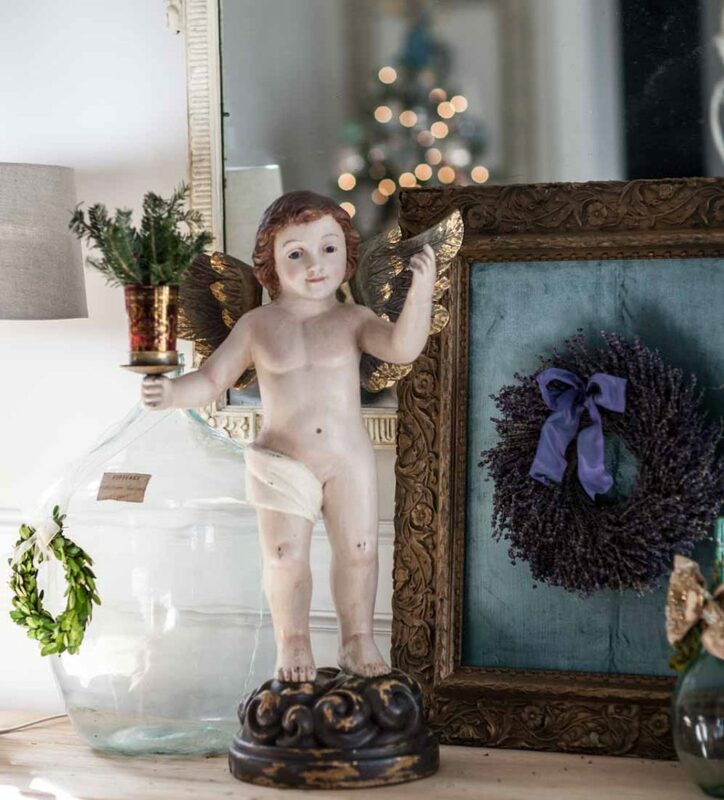 The Polder’s Old World Market giveaway was won by Debbie C. The Jackson and Perkins giveaway was won by Julie B.
I have an affinity for angels and use them in my decor all year long as well. They are especially meaningful at Christmas and Easter time but I do so enjoy them every day! Love your beautiful angel! Would love to know where you got the French candlestick lamps on the table. I am looking for one to use in my family room. It is from Aidan Gray Marsha. I ordered it from their website. I too am a sucker for angels and cherubs. I have 4! But if I had seen that precious herb, I’m sure I’d have snatched it up too. AND he’s utilitarian! Can’t beat a multitasking angel! 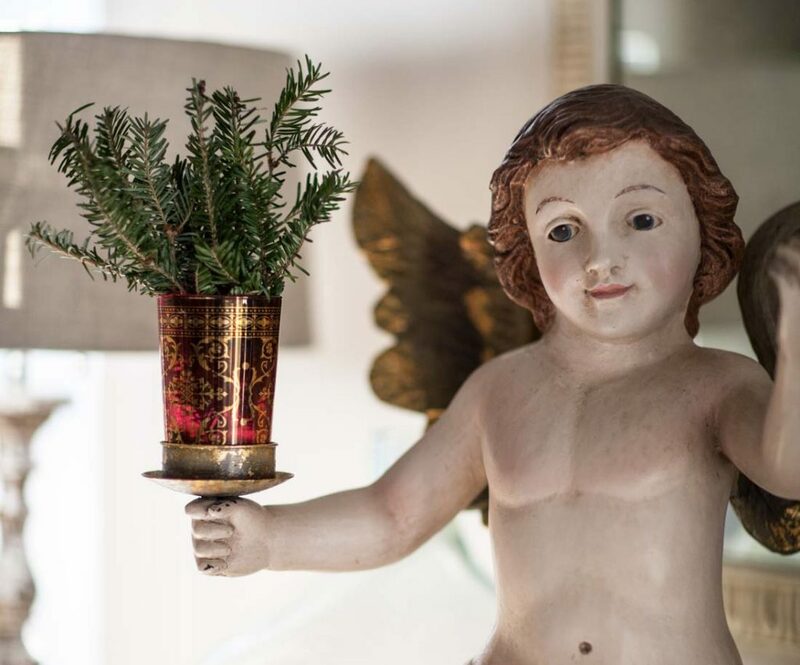 Love your angel and love how you will be able to have fun with him all year! The candles look neat, too. Angels are so special, and yours is particularly nice! 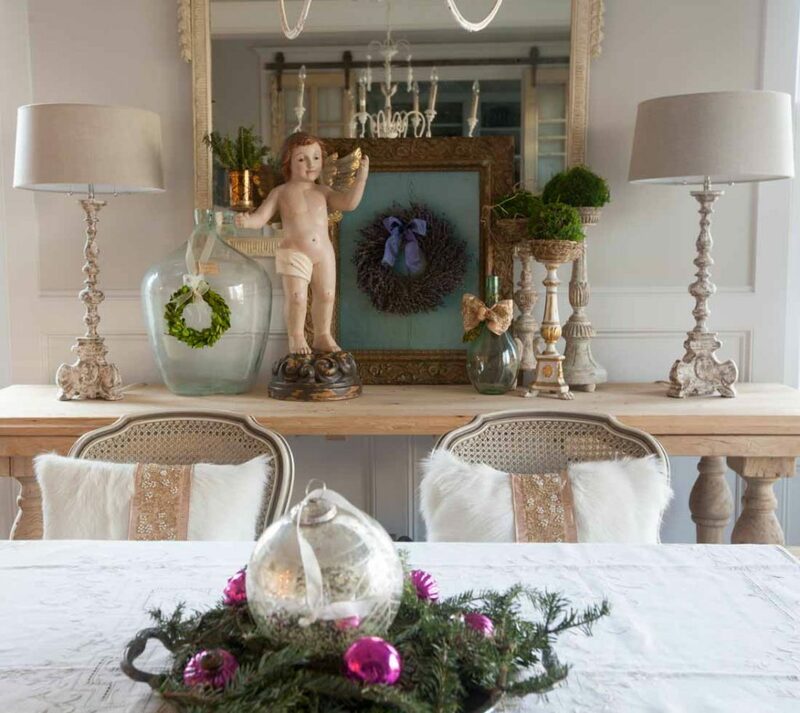 I like the idea of using something year round in different seasonal ways! Thank you so much for the J&P prize! I’m really excited! I’m so thrilled you won Julie! Ha, glad you enjoyed my silly quote. Oh My! I purchased the same little candles from balsam hill and I love them dearly! One set was enough to complement the rest of my ornaments 9′ tree. I love your beautiful angel. 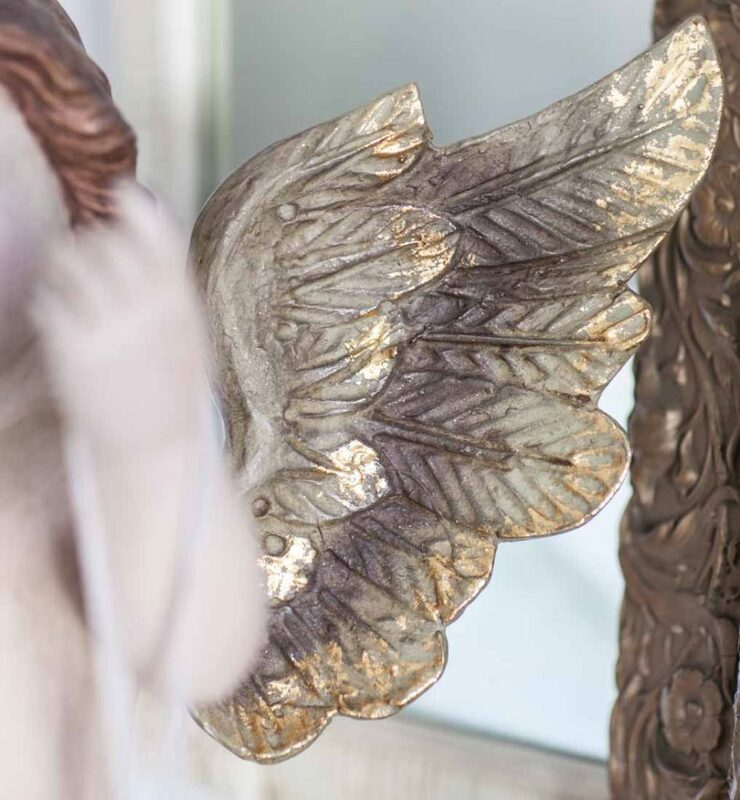 My wonderful grandmother was a very devout Catholic and had angels all over her house. Seeing yours make me think of her. Thanks for the memory. I love buying thinks that can be used year round! The angel is gorgeous! I listened to my first podcast and loved it! I listened to the one about how to choose a sofa. Your story about your first couch was hilarious! You have a wonderful sense of humor and great style Anita! I love your book too! There is no way I would buy a couch every 7 years! Mine need to last. Bit longer. I finally purchased a beautiful new sofa this year after looking for over 2 years. True confession, my sofa is about 10 years old, so Yvonne is going to tell me to ditch it! I know you said the angel you purchased was sold out but could you share with us where you purchased it or who manufactured it. Thanks so much.